November, 1902. Sun. 30. 14º Fair, S.W. Fine day. At ch. morn & evg. Dan Robbins funeral: died at Dubuque, Friday. Mon. 1. December. 30º Fair, S.W. 40º P.M. Fair day. Put on storm windows at office. - Busy; - evg also. Tues. 2. 32º cloudy. E gtle. - Snow began just after dinner & kept at it steadily all P.M. & evg. - C in P.M. Mission dinner at church; & M.B.A. banquet supper. Office till after 10. Wed. 3. 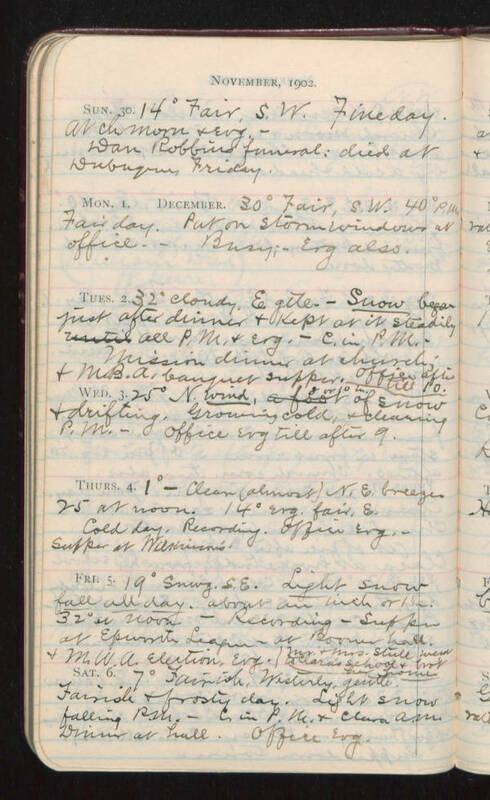 25º N. wind, 8 or 10 in. of snow & drifting. Growing cold,, & clearing P.M. - office evg till after 9. Thurs. 4. 1º - Clear (almost) N.E. breeze 25 at noon. 14º evg. fair, E. Col day. Recording. Office evg. Supper at Wilkinson's. Fri. 5. 19º Snwy. S.E. Light snow fall all day. about an inch or 1 1/2 32º at noon. - Recording - supper at Epworth League - at Boomer hall. & M.W.A. election, evg. Mr & Mrs. Stull went to Clara's school & took her home. Sat. 6. 7º Fairish. Westerly gentle. Fairish & frosty day. Light snow falling P.M. - C. in P.M. & Clara A.M. Dinner at hall. Office evg.